Manufacturer of a wide range of products which include gold sheet rolling machine and gold plate rolling mill machine. By keeping the pace with the current market standard, we are engaged in providing an exclusive array of Gold Sheet Rolling Machine. This rolling machine is developed under the direction of our experts & finds its application in several industries like jewelry, automobile, aeronautical & various other for rolling metal sheets and wires. Our skilled workers measure each of the rolled metal sheets produced by the finishing mill to ensure that the desired dimensions. 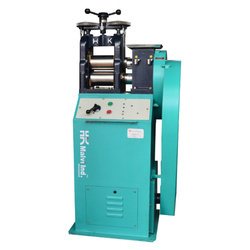 These S1 Gold Strip Rolling Machine models rolling mills are ideal for Making Gold & Silver Strip for further processing of making Coins, Bars & Jewellery application. The Machine is Designed in Gear & Bearing Moving System and uses less power consumption with mass production output providing 0.02 tolerance and has shaft attachement made for non jumping like other. Kindly ask us for more details or visit us in our factory.